A visit by an Israeli Jewish blogger to some of Islam’s holiest sites has stirred up controversy and anger. But should it have? A photo of a smiling man dressed in a traditional Arab thawb, keffiyeh and agal while standing in the middle of the Prophet’s Mosque in Medina, Islam’s second holiest site, has sparked online outrage among some Arabs and Muslims. 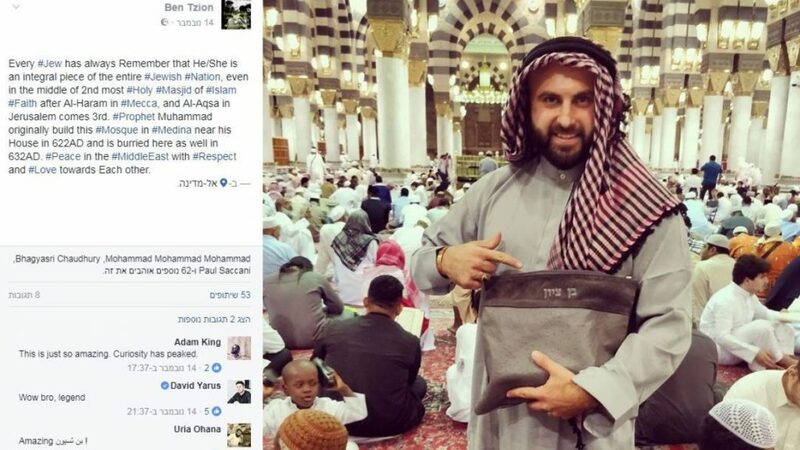 That’s because the man in question, who has posted his photo posing with a bag emblazoned with Hebrew letters reading ‘Ben Tzion’, is not a Muslim worshipper but an Israeli Jewish blogger. Instagram, where Ben Tzion had been chronicling his escapades, suspended his account, he claims, and the account is, at the time of writing, no longer active, following a deluge of angry comments. Under the hashtag ‘#صهيوني_بالحرم_النبوي‘ (‘Zionist_in_the_Sanctuary_of_the_Prophet’), numerous Arab Twitter users expressed severe criticism of Saudi Arabia for allegedly breaking the Arab boycott of Israel, seeing this as a further escalation of the kingdom’s apparent attempts to normalise relations with Israel. Some took it as an opportunity to spew bigoted anti-Jewish sentiment. “Umar Ibn Al-Khattab… expelled Jews from madina [sic] 1400 years ago and now Saudi government are [sic] allowing them back again,” wrote one Twitterer. The incident became a battleground in the ongoing Gulf propaganda war between Qatar and a Saudi-led alliance which has laid it under siege, supporters of which have accused Qatar of being an Israeli stooge. The truth is most Gulf countries have been discreetly cultivating relations with Israel for many years now. “You prohibit Qataris from entering it but you allowed your cousin, the Jew, to enter,” wrote one Qatari user. Despite (false) allegations that the Israeli blogger was on an officially sanctioned visit and that the Saudis had knowingly let him enter, Ben Tzion himself maintains otherwise. Speaking to BBC Arabic, he said that his trip, for which he used an undisclosed non-Israeli passport, was a private visit, to meet Saudi friends he had got to know in college in America (on a previous visit, he had visited a college friend in Iran). In a telephone interview with the Times of Israel, Ben Tzion explained that the visit to Saudi Arabia was part of a regional ‘goodwill tour’ which also took him to Iran and Lebanon, both of which Israel defines as ‘enemy states’, prohibiting its citizens from travelling there, on pain of possible but unlikely prosecution – unless they happen to be political dissidents or Palestinians. This two-sided rejection might be the reason why Ben Tzion keeps his full name and current location under wraps. In fact, a source close to the Times of Israel informed me that, although Ben Tzion occasionally blogs for the online news site, nobody there has met him in person. Of Russian origin, Ben Tzion grew up in the United States, where he graduated from Babson College, a prestigious business school, and worked in real estate in the Boston area – he holds American, Russian and Israeli citizenship, my source informed me. This revelation will shock and dismay a large number of Israelis, many of whom, I have learnt through years of interaction, are convinced they would be lynched upon entering Palestinian neighbourhoods of Jerusalem, let alone travelling deep into ‘hostile’ Arab territory. This is especially the case among Israeli Jews who equate contact with Arabs as a form of betrayal and self-hatred aimed at the destruction of the Jewish state by other means. But such contact highlights the importance of direct, grassroots people-to-people contact. It helps demystify and humanise the other side. While this, in and of itself, will not solve the complex issues at the heart of the decades-old Israeli-Palestinian conflict, understanding and empathy are vital prerequisites to eventual resolution. Many Arabs will protest that this whitewashes the Israeli mistreatment of Palestinians and normalises the occupation. In my view, a distinction must be made between private, independent Israeli citizens and activists, and representatives of the state or members of organisations affiliated with the state or defending its crimes – and this distinction should be incorporated into the Arab boycott. This does not mean that Arabs have to agree with Israelis or turn on the Palestinians. It simply means that they need to engage with Israelis and assist their Palestinian brethren in making their case. Some Arab activists will counter that the boycott is effective and is working, as evidenced by the panicked anti-BDS legislations and activities of the Israeli state, including the recent decision to deny entry to a delegation of European parliamentarians and officials who had intended to visit jailed Palestinian leader Marwan Barghouti. However, the limited successes BDS has scored lulls activists into a false sense of confidence. Even though Israel has become the subject of greater social and political opposition in Europe, this has scarcely made a dent in its economy and, as protection against possible but unlikely European sanctions, Israel has actively nurtured deepening ties with Asian and African states. Moreover, the current situation empowers extremists, who increasingly call the shots, and opportunists, who take advantage of the chaos. While principled Arab activists and citizens refuse to reach out to ordinary Israelis, the de facto Netanyahu oligarchical dictatorship is forging ever-deepening ties with equally unscrupulous Arab despots and dictators. And they are doing so not in the interest of peace, justice and security, but to further their own self-interest through conflict and war, injustice and insecurity. Grassroots contacts founded on principles and dialogue are not simply about paving the way to a better tomorrow – they are also about sidestepping a worse and more destructive future from sucking our region even deeper into the abyss. Another feature of the Arab backlash on social media was the rejection as somehow impure or contaminating the notion of a non-Muslim entering an Islamic sacred site. As someone who has entered the holiest sites of many other religions, I find this attitude bigoted and intolerant. While there are plenty of mosques, including the fourth holiest in Islam, the Great Mosque of Kairouan (Tunisia), which permit non-Muslims to enter, Mecca, Islam’s most sacred city, is the exclusive domain of Muslims. This is completely unacceptable morally and counterproductive culturally and politically. 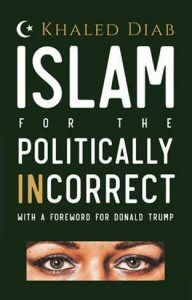 Moreover, allowing non-Muslims into Islam’s most sacred heart would open up its soul to the rest of humanity. This article first appeared in Haaretz on 23 November 2017.